The new all day Italian restaurant/bar Gallo Nero with unique décor and excellent choice of Italian dishes and wines, is the ideal choice for luncheons and dinners. 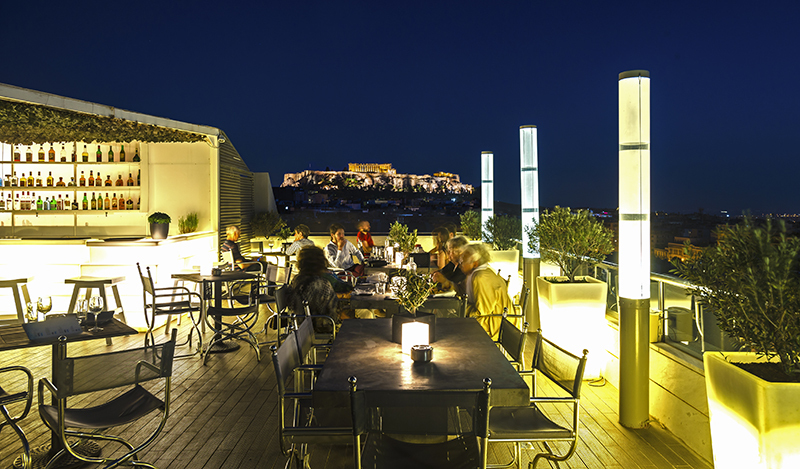 The multi awarded roof top restaurant / bar ST ASTRA East with Asian cuisine and sushi bar offers spectacular views of the Acropolis, Lycabettus Hill and Athens by night !! The new OAK room café , a popular meeting point of Athens, serves variety of coffees, snacks, sweets and drinks. During the summer months one can enjoy a refreshing dive in the roof top swimming pool or relaxing dinner experience at the Roof Garden Other facilities include: fitness center, gift shop, business center, outside catering services, parking facilities for 300 cars. Park Ηotel offers stunning new meeting rooms, SILVER FOREST & ATLANTIS. Modern, decorated with “state-of-the-art” materials and fitted with the latest in audiovisual equipment for conferences, meetings, presentations, ιncluding social events, dinners and cocktails.